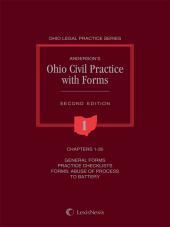 Alabama Civil Practice Forms, Fourth Edition offers an extraordinarily comprehensive selection of sample forms for Alabama practitioners. In addition to most common forms, this authoritative compendium includes many forms that are required only occasionally, but cannot be found in other sources. 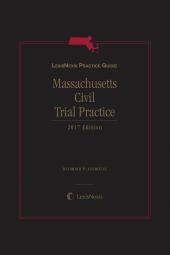 The fourth edition also contains law and practice notes on the controlling law that provide practitioners with basic legal principles and serve as a good starting place for additional legal research. 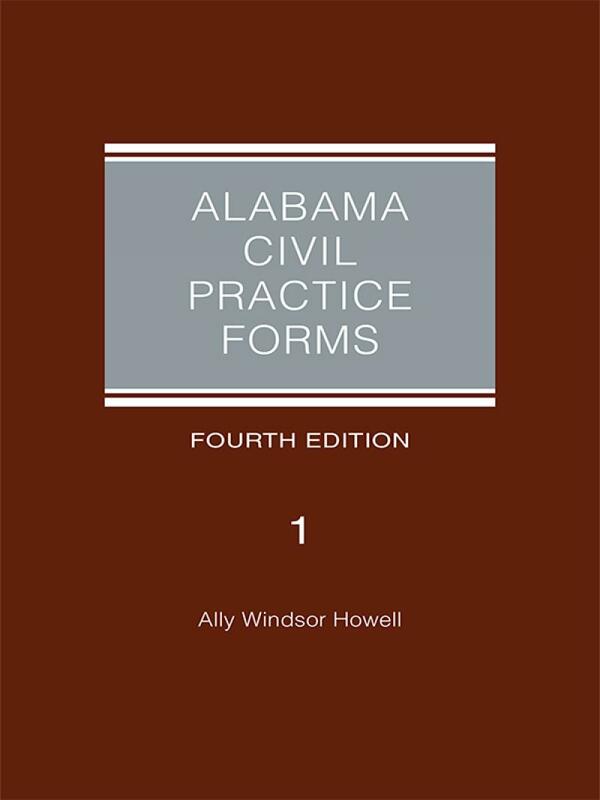 Alabama Civil Practice Forms, Fourth Edition offers an extraordinarily comprehensive selection of sample forms for Alabama practitioners. In addition to most common forms, this authoritative compendium includes many forms that are required only occasionally, but cannot be found in other sources. The fourth edition also contains law and practice notes on the controlling law that provide practitioners with basic legal principles and serve as a good starting place for additional legal research. Whether you are seeking damages due to faulty traffic lights, making a motion to dissolve a writ of seizure, or filing a complaint for divorce, you will find the form you need in Alabama Civil Practice Forms, Fourth Edition. Alabama Civil Practice Forms has not simply been compiled for Alabama attorneys -- it has been shaped by them. Now in its fourth edition, Alabama Civil Practice Forms reflects years of suggestions from lawyers around the state, thus ensuring its relevance to active practitioners. At the same time, yearly supplements guarantee that all forms reflect the latest legal usage in the state. Author Ally Windsor Howell has even included administrative forms that attorneys can use to streamline their law office practice. Of course, every case has its own distinctive features, and every form should be modified to meet individual circumstances. 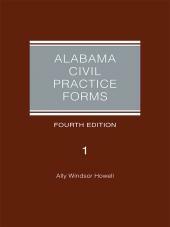 To help attorneys craft persuasive and effective forms that reflect their clients needs, Alabama Civil Practice Forms, Fourth Edition also contains case citations and is keyed to the Code of Alabama. Ms. Howell is the author of a number of books including, Alabama Rules of Civil Procedure Annotated Fourth Edition, Alabama Personal Injury and Torts, and Trial Handbook for Alabama Lawyers Second Edition. She has also contributed chapters to a number of published works. She has been published in numerous legal journals and newsletters, and has presented papers and conducted CLE presentations for various organizations, such as ATLA, the Alabama Trial Lawyers Association, and the Montgomery County Bar Association. Ms. Howell was an administrative partner in the firm of Shinbaum & Howell in Montgomery, Alabama from 1990 to 1998, where her responsibilities included personnel, payroll, vendor relations, and supervising the litigation work of the other attorneys. Previously she served as Chief of Legal Section and Assistant Attorney General for the Alabama Medicaid Agency in Montgomery, where she drafted the Agency¿s Administrative Code, and represented the Agency in court proceedings and administrative hearings. From 1974-82 and from 1983-89 she engaged in private civil litigation and appellate practice in Montgomery. In 1982-83, Ms. Howell served as an Adjunct Professor at Jones School of Law and Faulkner University in Montgomery. Ms. Howell is admitted to practice before the Alabama Supreme Court; the United States Supreme Court; United States Courts of Appeals for the Fifth, Eleventh, and Federal Circuits; United States District Courts for the Middle, Southern, and Northern Districts of Alabama; the United States Tax Court; and the United States Claims Court. She is a graduate of the National College of Advocacy of the Association of Trial Lawyers of America (ATLA), and received her LL.M. degree from the State University of New York at Buffalo School of Law, her J.D. degree from Thomas Goode Jones School of Law, Faulkner University, Montgomery, Alabama, and her B.A. degree from Huntingdon College in Montgomery.